My goodness, this machine is fancy. As far as the best espresso makers go, this is an all-in-one, mammoth of a caffeine-producing machine. After poking around, doing some tests, and checking under the hood (metaphorically), here’s what I found. 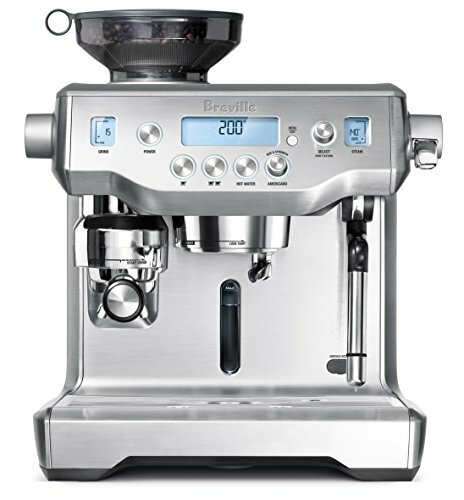 For the truly dedicated espresso lovers, like me, the Breville Oracle is a masterpiece. You’ll want to display it proudly on your counter and make lots of tasty, energy-fueled espressos to get you through your busy day. Sounds obvious, but I care how much it costs. And ultimately, is it worth that price? This machine is pricey. Retailing at $2,000, it is not for those looking for a budget espresso option. (Check out the latest prices and discounts!) That being said, given the fact that it is a genuine coffee shop quality machine, the price is about right. If you’re looking into the Oracle for at home use, you can probably find a cheaper option. If you’re looking for a restaurant, or any kind of high volume location, this is roughly what you can expect to spend. Is it cool looking? How big is it? This is important. The Breville Oracle is really pretty. The sleek and streamlined look makes up for its bulky size. At 16¼” x (D) 15″ x (H) 18“ and weighing in at 35lbs (eek), it is not easily stored. This is the kind of thing you display proudly, and once it is set up, you will never want to move it. Is it easy to use? Does it work consistently? Do I need to be a magician to figure it out? I’m always wary with super expensive machines that boast “café quality espresso” because that is usually code for “really hard to use.” Being a barista takes years of repetition and education to get good at dialing in espresso shots, consistently tamping the espresso, pulling the shots, and steaming milk to perfection, all within the span of 90 seconds. Fortunately and remarkably, someone whose only barista experience is spelling names wrong, can operate this machine with great ease. 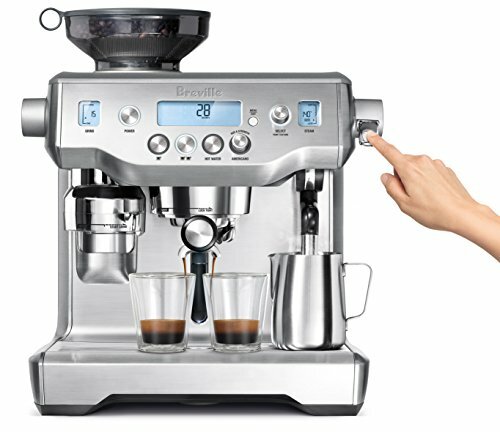 The Breville website has a great instructional and informational video about this machine, complete with British and Australian accents (the mark of any good video). Breville “Coffee Guru” Phil McKnight walks you through the technology behind the machine, as well as why you need it. Honestly, it was enough to convince me, but even without the tutorial, the benefits of this machine are evident. McKnight describes how most people have a preference for the taste of manual espresso, while desiring the ease of an automatic machine. Couldn’t agree more, mate. Manual espresso machines are difficult to use, and auto machines often sacrifice taste for simplicity. This machine offers the best of both worlds, and takes the guesswork out of all the hard parts of making a good espresso drink. Overall, it’s easy to use. And that’s worth an A+ to me. Automatic grinding, dosing, and tamping. No need to own a scale, find the perfect grind setting, or even own a tamper. The machine will do all of these things for you. Just press a few buttons, and add beans. This feature is a delight because not only can you set it and forget it, you can choose the desired temperature and texture for your milk. Steaming milk is the most frustrating part of any espresso drink construction, but with this you literally just press a button and the machine works its magic. Cappuccino foam? Latte Foam? Who cares!? The world is your oyster. Not only is the grinder automatic, but it’s also a Burr grinder. Which is the best kind of grinder there is. The name refers to the method by which the beans are ground. Instead of chopping it up until small pieces, the Burr has a dual blade system that crushes the beans to the desired size. Makes it sounds more like medieval torture device than friendly coffee product, but that’s just the way you want it. Another great auto feature, this fills your cup with hot water immediately after espresso extraction without having to move anything. The height of luxury. Heating up your cup is something you wouldn’t think to do, but extracting espresso into a warm cup keeps the flavor consistent and delicious. With the warming tray, you can heat your cup without putting it in the microwave and burning your hand off. This alert is designed to not let you start making anything if you don’t have enough water available. Great for folks like me who can’t function before caffeine. This is a tricky one because a lot of this depends on the kind of espresso you buy, how you grind it, and what your personal taste preferences are. But, regardless of that, I want to know does this machine maximize the espresso it’s given, or does it make it worse. In order to give a blanket judgment on this, I made up a test using two different espresso blends of opposite quality (one very good, one not so good) and let the machine do the rest. The fact that you’re not going to be able to store it is not actually a negative, because you’re going to want people to see this bad boy. All of the many (and really, there are a lot) parts to this machine fit perfectly together for a concise and stylish presentation that will make you want to show it off. One aspect of this that I particularly enjoy is how the hopper and grinder on the top fit seamlessly with the design. Often times with a built in grinder, the machine can be unsightly, but that is not the case here. So enjoy the design and look, and make all who see it envious. For the price your paying, you’d hope this machine would make a damn good cup of espresso. Thankfully, it does. I attribute this mostly to the functionality of the machine (refer to all the auto settings), but even the crappy espresso blend I used tasted good. If you’re an espresso purist, you’ll notice the excellent golden honey coloring, and the beautiful crème. If that doesn’t mean anything to you, you’ll notice it’s a good strong espresso shot. If you’re one who likes lattes or cappuccinos, you’ll love the taste. Burnt milk tastes like Satan’s sweaty gym clothes, but due to the automatic milk temperature setting, that will never be a problem. I really wish I could be more critical of this machine because the price scares me (a little). But, as it turns out I can’t. The only real problem I could find is that it seems that some users have had trouble with maintenance. In my experience, however, Breville customer service is friendly, knowledgeable, and genuinely wants you to get that caffeine in your face without hassle. So if you are experiencing any problems, and you start to get that sinking feeling that you spent $2,000 on another fancy toy that doesn’t work, give them a call. It’s worth it. Don’t give up, get the most of what this excellent machine can offer. By way of wrapping this up in a nice little bow, the combo of manual and automatic machine gives you the ability to really curate the experience to your tastes, even if you don’t know what your taste is. This is a machine that’s not just for the espresso purist, but will wow even those with the most discerning of palates. 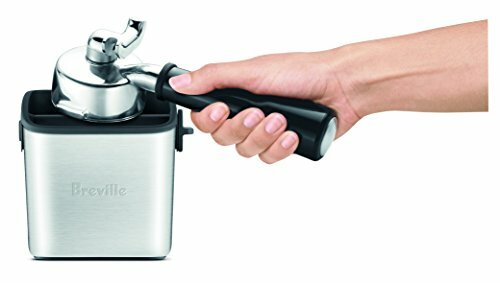 Overall, the Breville Oracle is a winner. If you’ve got the cash to spend, send me some, then go out get this bad boy and start enjoying what luxury tastes like.